I enjoy playing games - I enjoy technology - and I enjoy working in education. As a side note, both my daughter and I are learning how to play the guitar together. Put all of this stuff together and you will find both my daughter and I learning how to play and having fun while using GuitarBots! GuitarBots is an online game that teaches you how to play the guitar. I think of it a lot like the popular Guitar Hero but instead of a guitar shaped controller with a few buttons for strings and a toggle switch for strumming - you get to use a REAL guitar with REAL strings and actually learn how to play. I came across this one day and decided to give it a try. What an awesome learning experience!! It is free to create an account and you are given 15 minutes of play time each day for free. The idea is that you play the notes just as the little ball bounces on the strings. numbers or blocks on the strings indicate which fret or chord to play. Your microphone picks up the sound and lets you know if you were accurate or not. It will even tell you if you are a bit early or a bit late with your notes. You rack up points by accurately playing the notes. The points you earn determine the number of stars you will receive. You then use the stars to unlock higher levels. The game comes with a built-in tuner to help you make sure that you have a correctly tuned instrument before you begin to play. You can also earn badges for amount of playtime, number of notes played, etc. All of your stars, points, and other progress go towards your guitarist level. 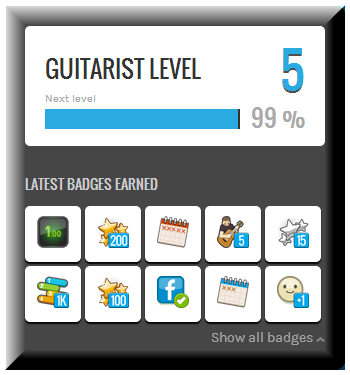 My guitarist level and badges as of this writing. I must admit that I am very much enjoying this method of learning the guitar. So much, in fact, that I have chosen to purchase a one-year subscription which grants you unlimited playtime each day as well as access to a live guitar teacher. (At this time I have not accessed this feature yet - so no feedback on that). You can purchase monthly access for $15, yearly access for $80, two-year access for $120, and lifetime access for $300. I thought this seemed like a great value - especially when compared to paying for guitar lessons. That said, I see great value in a human guitar teacher but GuitarBots does an awesome job of motivating folks to get that practice time in. I think they could work very well together. My daughter also plays clarinet for the school band and has never been as motivated to grab it and play as she is with the guitar and GuitarBots. I used to frequently push and prod her to pick up the guitar and practice a bit and it often just sat there untouched but after introducing her to GuitarBots, she has grabbed it every day since. Here is a short video of my daughter playing at the early stages of the game. This game has really helped me to make my fingerings better and become better at making chord changes. If you are interested in learning guitar or even if you are pretty good already and just want to have some fun, I would highly recommend this game. There is no cost and no need to download and install anything. It was so simple! Do you know of any other fun and highly educational learning games? Great post Greg, Guitar Bots sounds like a ton of fun! I love the fact that you're encouraging your daughter to pick up and play a real instrument vs playing games like Guitar Hero all day. There are so many positive benefits to learning a REAL instrument compared to most things kids are into these days like watching tv, playing video games etc.